They were finding the lack of fences on two external boundaries, that met in a corner, needed addressing. 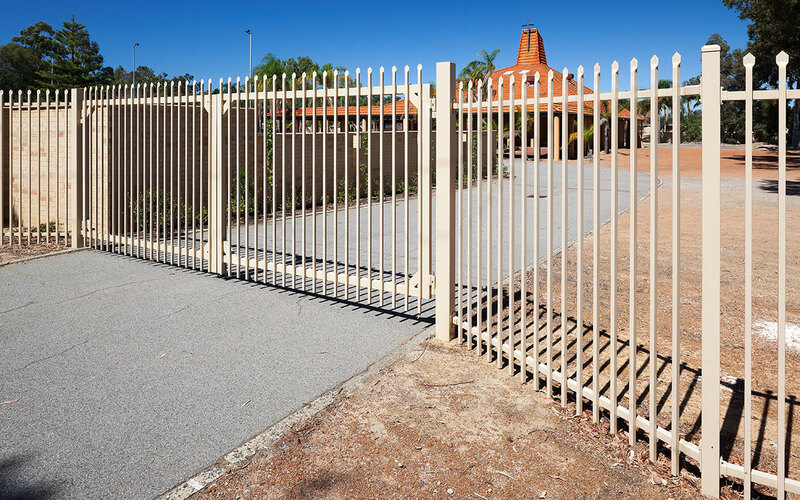 It was important for the church to have a fence created and installed to not only mark their boundaries, but to match the presentation and style of their buildings, and so they couldn’t choose any fencemakers or installer. They came to us in 2011, when we were operating as Kalamunda Fencing & Gatemakers. We are still happy and equipped as K-Line Fencing Group to do such works for church and similar prestige community sites today. We installed a durable steel fence—created from garrison fencing with two sets of swing garrison gates—around the boundary lines where required. We made sure its colour scheme made it seamlessly blend in with the church aesthetics. The resulting fencing was a customise solution to meet their requirements so the fencing would match the church’s building colour scheme. The client was 100% satisfied.